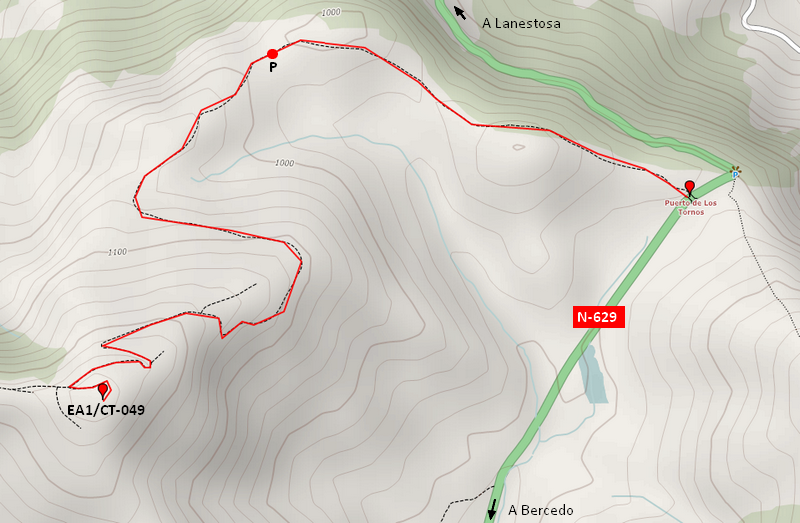 Today I had the choice of making a short activation and, having done this weekend two EA2 summits (usually to gain fewer points than in neighbour associations) I drove to Cantabria to try to activate Cañoneros, 1200m and 6+3 points. While getting closer to the "Puerto de los tornos" mountain road, the snow became to be higher on the sides of the road, on some points of more than 2 meters. But the road itself was pretty clean. So, after reaching the top of the road, I drove thru the deviation to the summit. There are some wind generators, and normally the road (3,5km) can be done. Today was not the case. After driving a bit more of 1km, with temperature now below -1ºC, I decided to park the car taking the ruckshack, bothy bag included. Some light snow was falling, but no strong wind at that moment. While ascending, the path was quite clean with no ice, so it was no complicated to hike. Even more, people from wind generators and some radio and mobile repeaters were up and down continously on 4x4 vehicles cleaning the route. On the summit the closer generators were stopped, so I have no electronic noise at all. With a bit more of wind and just on the side on the road, I made a small hole on the snow, enough to put some plastic bags and over them the bothy bag. In these kind of conditions you can enjoy the advantage of using the norcal doublet, not having to be in and out to change the links on the dipole. Once inside, you must not go out again until you finish. On some moments, the wind was a bit stronger, but the main problem was the temperature (now between -3 & -2 deg C). The snow started to fall harder, and I was not sure about being able to drive the car back to the main road safely. So finally, after about 30 QSOs ad 2 S2S with HB9CGA and HB9CGL, I turned off the 817 and returned to the car. Even using gloves (without the right first 2 fingers cut to write and key) keying became more and more difficult. I would thank the OM who get into the pile-up to make me note that Ulrich HB9CGA was calling for a S2S QSO, as the pile-up was quite large. Just a note, It's no necessary to repeat 2,3 or 4 times your callsign. Once I've readed it, I had to wait the people to end repeating again and again. This only makes the pile-up slower. Usually I am able to catch one or more callsign the first time I hear it, but later I must wait 15-20 secs. until the "repeaters" end... no advantage. Anyway, It was, as always a privilege to share these moments with the SOTA mates. Hope the weather calms a bit around here making the activations longer. I am not happy when leaving people, bands and/or modes without working because of the summits conditions.